I love a tasty and fast salad for lunch most days. My problem is that I get caught up in what I’m doing and don’t want to stop. And if lunch is at all complicated, I’ll skip it. 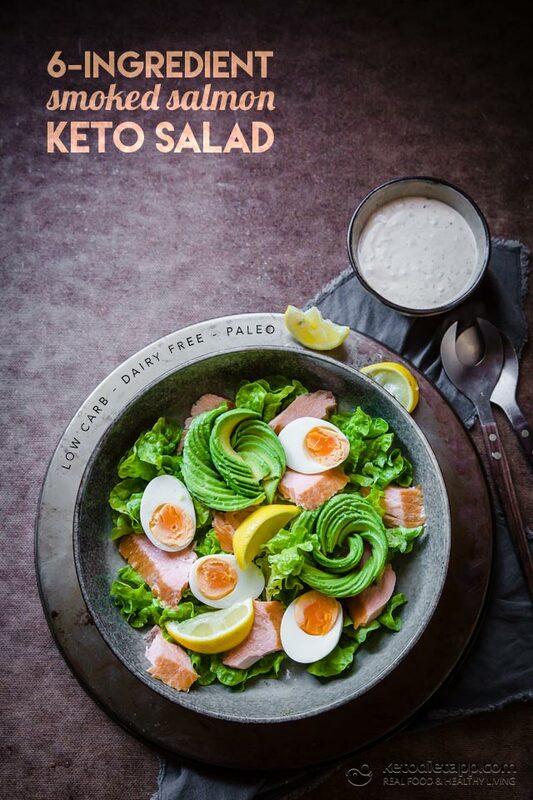 That’s where a keto-friendly salad made with keto superfoods like this is brilliant. 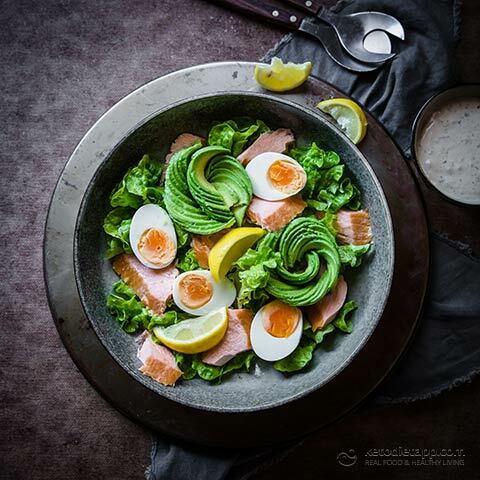 Avocados will provide heart-healthy monounsaturated fats, and both salmon and avocados are high in potassium that will help you avoid keto-flu. If you have hard-boiled eggs in the fridge it takes less than five minutes and almost zero effort to throw together. I used hot smoked salmon, because I adore it and always have some on hand, but you can use cold smoked or even fresh if you prefer. Enjoy! If you don’t have boiled eggs, boil some now. 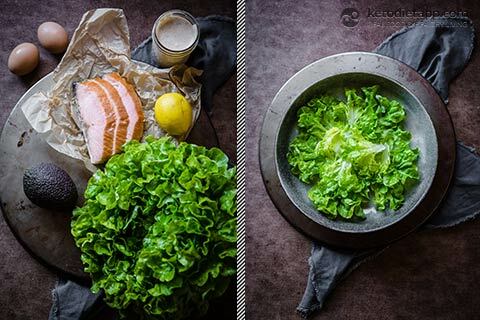 Rinse and drain your lettuce and lay it out in the bottom of two serving bowls or one large share bowl. Tear the salmon into bite sized chunks and scatter over the lettuce. You can either use hot smoked (cooked) or cold smoked (raw) salmon. Peel the eggs and cut them in half. Place the halves on your salad. De-seed and peel your avocado and slice it. Arrange it on top of the salad. 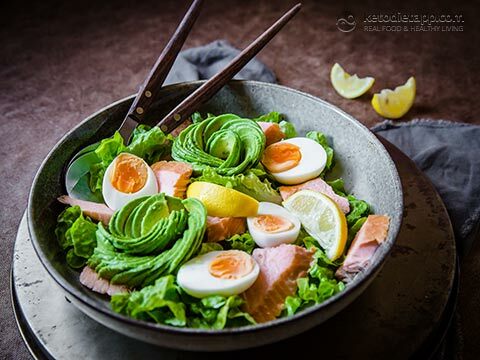 Squeeze a bit of lemon juice over the salad and drizzle with olive oil the salad prior to eating. 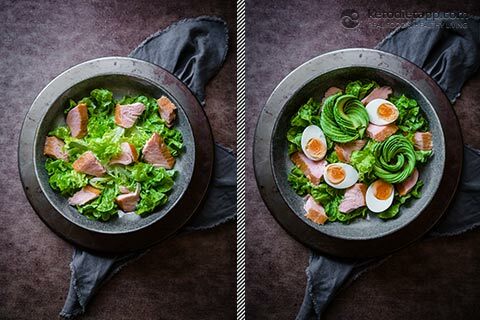 Optionally, you can swap the olive oil with keto-friendly dressing. Store in the refrigerator, without the avocado, covered for two days.